"This cake requires no icing, but you can ice it if you wish which is truly delicious." Preheat oven to 350 degrees F (175 degrees C). Grease one 8x8 inch square pan. Cream the butter or margarine add the sugar and continue creaming until light and fluffy. Beat in the eggs one at a time. Stir in the maple flavoring. Combine the flour, baking powder, and salt. Add the flour mixture in 3 parts alternately with the milk to the butter mixture, beginning and ending with flour. Stir in the walnuts and pour in the prepared pan. Bake at 350 degrees F (175 degrees C) for 40 to 45 minutes or until an toothpick inserted in the center comes out clean. 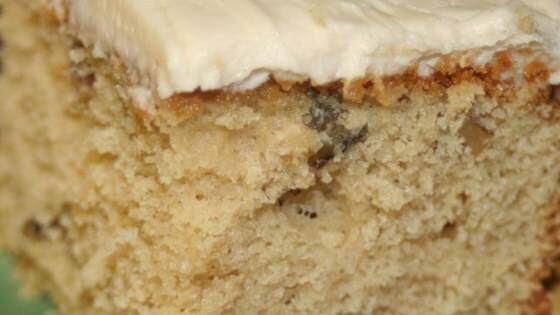 Let cake cool then frost with Maple Butter Icing. I doubled the recipe and made a layer cake, frosted with the maple frosting for a birthday party. It was great!! Good and easy recipe. I topped with Maple Icing from this site (my favorite icing!). Used a little bit of whole wheat pastry flour. Loved the walnuts! excellent cake! stays moist for a few days, too. I made this cake for my mom for her birthday. Came out very well. I used an extra 1/4 cup of milk since some people said theirs came out too dry.